Remember any wording can be changed to fit your desires. They can be combined as well.See Option 8 for including children. _____and ___ come from two different families, two different heritages. We are especially grateful for the values which have flowed into them from those who have loved and nurtured them along life's way. The heritage each brings to this marriage will continue to be an important element in their lives, but now will be shared between them. Out of these two families, a new family will be created. Please take the two taper candles, representing your individual selves and light the center candle representing your marriage. (together bride and groom take their tapered candles and light the center unity/marriage candle) As you light this candle today, may the brightness of the flame shine throughout your lives. May it give you courage and reassurance in darkness, warmth and safety in the cold, and strength and joy in your bodies, minds and spirits. May your union be forever blessed. 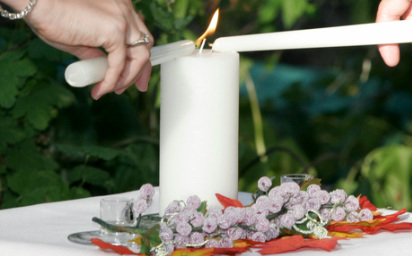 The Unity Candle ceremony is a beautiful symbolic representation of a couple’s joining in marriage. The taper candles represent not only ________ and ________, but also their families; for it is their families who, through love and support, helped shaped who they are. The center candle represents their marriage- the joining of two friends with the added roles of husband and wife. It is the light of love and the light of new beginnings. Please take the two taper candles, representing your individual selves and light the center candle representing your marriage. Notice that the flames burns brightest when both candles are participating, cooperating and present. A marriage is like that. Be forever present for one another, shining light and beauty. ______and _________, each time you light a candle from this point forward, in whatever traditions you create, remember this day, this moment in time.